We added a new member to the Ludt family in Singapore today....but to explain how it came to be, I have to go back a few months. 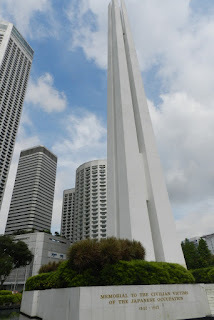 One afternoon this past October, Jennifer, the kids and I were on our way to Marina Bay to walk around the harbor, enjoy a fruit popsicle by the Merlion and ultimately take a ride on the Singapore Flyer. On our way, we made several stops on what turned out to be a day full of art, culture and history. 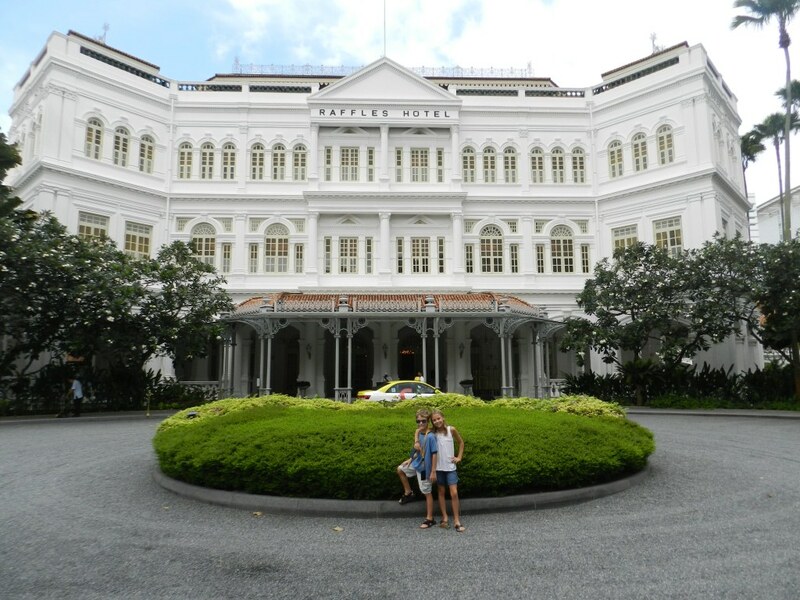 First, we visited the famed Raffles Hotel (we still have yet to have a drink at the Long Bar), a large British colonial style hotel, arguably one of Singapore's most well known icons. Next, we stopped by War Memorial Park, built in 1967 to honor the Singapore civilians who were killed during World War II by the Japanese. At the park, Sophia and Cooper impressed Jennifer and I with their ability to read part of the war memorial plaque written in Chinese characters (I guess the hour of Mandarin a day is actually paying off!). Our final stop before heading to the Singapore Flyer was the Esplanade Mall, a durian-inspired building (it is the "King of Fruits", afterall) that houses retail shopping as well as a concert hall, a theatre and various other art and performing arts venues. 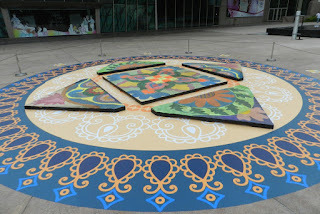 The Indian holiday, Deepavali, had just passed and Sophia and Cooper were quick to spot a Kolam outside - a geometric drawing made of colored rice, believed to help bring wealth and prosperity. After Sophia and Cooper educated us on the Kolam, we walked inside the Esplanade, where we (unknowingly) met our newest family member. 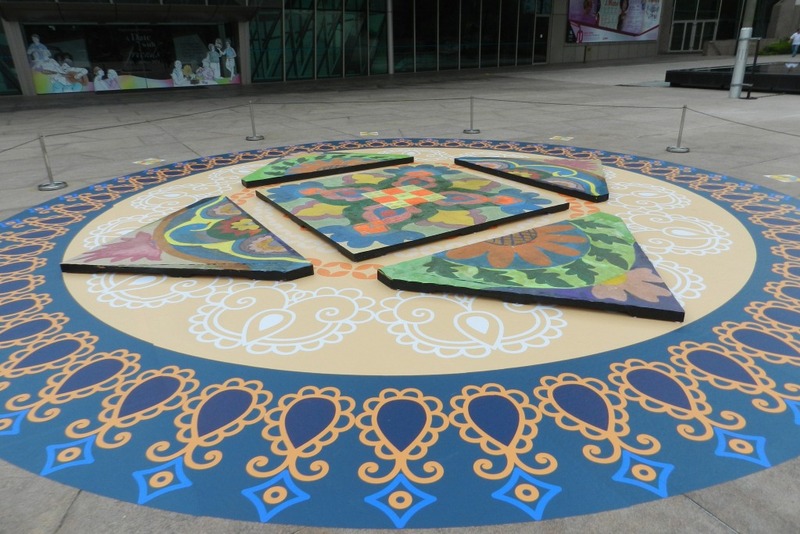 The Esplanade was celebrating its 10th Anniversary by displaying a large piece of artwork on the thirteen steps that greet visitors entering the building. The artwork, comprised of about two hundred resin cat and dog statues, was designed and created by Singaporean sculptor, Chua Boon Kee, and called 《猫狗的事，政府管了，我们也管》 - or - "In the Affair of Cats & Dogs, the Government's Involved and So Shall We". 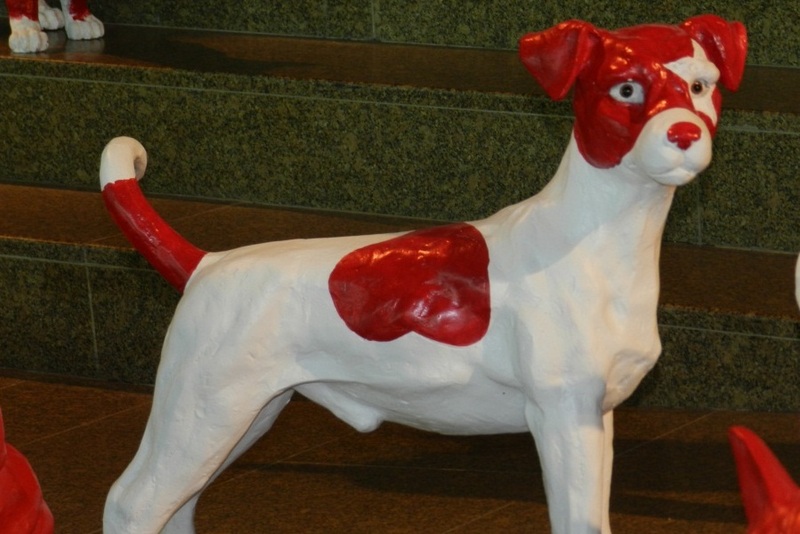 Officially, the art is described as "promoting a proactive spirit in the community" and is in response to a light-hearted comment made by Singapore's Prime Minister stating, "the minister should not be doing everything, including culling cats and saving dogs." For us, the statues were interesting, unique and cute. We spent some time trying to explain our perception of the artist's intent to the kids (be responsible for yourself - don't expect someone else to take care of you) - but at the end of the day, it was art. We respected and agreed with the sentiment, but mostly we thought the dogs were adorable, regardless of the intended message. A small sign provided details on the artist, his inspiration and a note about the possibility of "adopting" one of the sculptures by making a donation to the Esplanade. The next day, I called the Esplanade to inquire about donations and adoption. We really did like the art and were interested in making a donation, but the $2,000 price tag was a little steep (OK, REALLY steep). The kids were upset we weren't going to adopt a new dog (statue) but understood how expensive it was and forgot about it. Later that week, I came across an article about Chua Boon Kee, and an opportunity to receive a dog or cat statue directly from the artist by writing a personal letter describing why we wanted one of his sculptures. I figured, "Why not?" and wrote a brief note (Jen: Brief? When are you ever brief ? You could make a great politician, except you're too honest.) describing our move from the US, our love of dogs and how much we all liked the art. I had almost forgotten about the letter and artwork when I received a call from the Esplanade on Tuesday evening this week - nearly three months later. 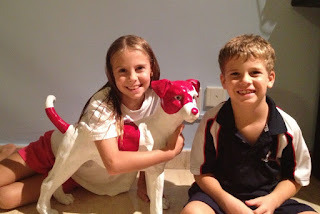 Like our children's Chinese instruction, my marketing know-how (BS writing style...call it what it is) paid off, and we had been selected to receive a dog statue - for free! Today, Jennifer and I once again headed to the Esplanade - this time to meet with staff at the exhibit office and collect our adopted dog. 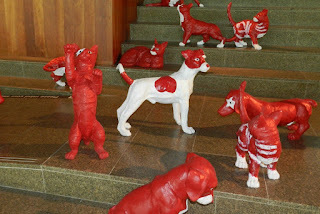 As you can see by the attached pictures, there were about 10 different styles of dogs making up the exhibit. While the opportunity to own a unique piece of art - something that would forever remind us of our time in Singapore - was great, I'd be lying if I said we didn't have a favorite style / breed of dog from among those that made up the exhibit. 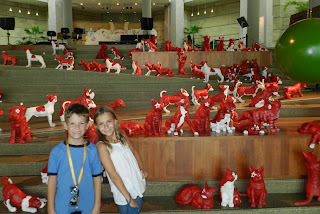 Sure, the Shar Peis, Daschunds, Beagles and Huskies were cute - but the Jack Russell style sculpture was by far a favorite for the kids, Jennifer and I. After waiting a few anxious moments for the staff to meet us at the Esplanade office, we were led to a small meeting area, where, standing on the table before us was our very own Jack Russell statue. We were so excited and couldn't wait to get him home to show the kids. We had almost forgotten he was a piece of art and were about to pick him up and carry him out of the building with us, like he was our pet....when the staff helped us wrap and pack him safely in a box for transport home. Once we were home with the kids, we slowly unpacked the statue and the kids were ecstatic (we pretended we didn't know which one they had given us). Next up, two very difficult decisions....where to display him and what to name him! So - we're pleased to introduce the newest member of the Ludt family in Singapore - Red (Red Rover). After enjoying a few days in Sydney, we made the short flight to Melbourne, ready to enjoy the holidays with great friends, Deb and John Voger. Deb, John and their two boys (Josh and Ryan) were neighbors of ours in West Chester, PA for about 4 years (circa 2002 - 2006). At that time, we often enjoyed an afternoon or evening on one another's deck with a glass of wine or a beer (Jen: Seriously..."A" glass of wine or beer? What alternate universe were you living in? ), and the kids always enjoyed playing together. With that in mind, we were excited to see our friends who graciously welcomed us into their home to spend Christmas and New Year's with their family. Truth is, our visit to Melbourne would have been complete had we spent our time sitting on the Voger's back patio, catching up on each other's lives (see forthcoming post from Jennifer for more on that part of our visit). 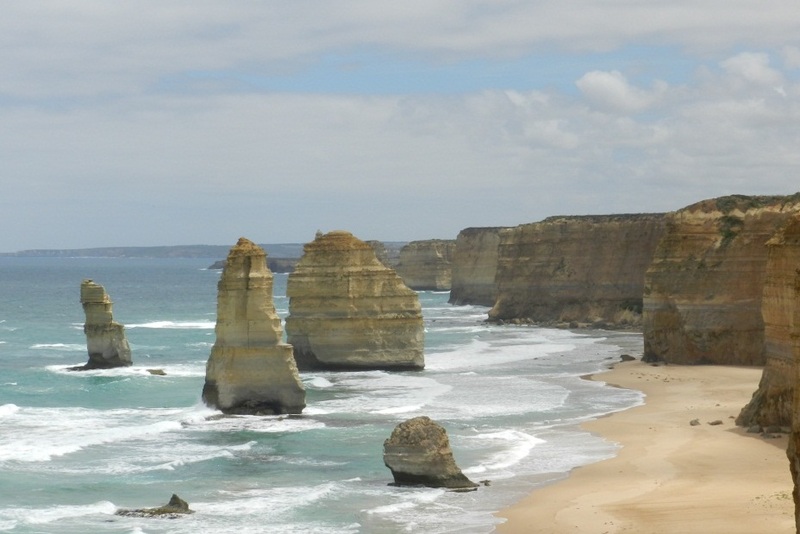 But, Australia is obviously more than half a world away from the east coast of the US, and who knows when or if I'll have another chance to experience the "Great Ocean Road" (GOR) and cross it off my bucket list. 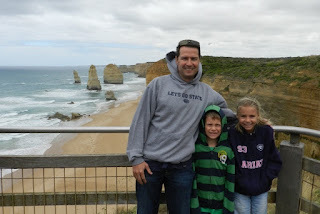 So, after a few days visiting with the Vogers, we packed up the car and headed Southwest toward the Great Ocean Road and the beautiful coastline. My comfort with driving had improved tremendously since the excitement in Sydney, but we decided to book two nights at a great little place in Apollo Bay so we could take our time and enjoy the GOR safely. Leaving Melbourne mid-morning, we planned to stop a few places along the way to check out the sights and have a lunch along the beach before arriving in Apollo Bay...and we did just that. Our first stop was in Torquay, a coastal town known for great surf beaches and tons of surf shops. There were plenty of both, but we didn't stay very long because we got a first glimpse of the brilliant sandstone cliffs further down the coast and decided the scenery ahead of us would be more spectacular. Over the course of the next two hours we stopped several times to snap a few pictures and take in the scenery, which seemed to get more beautiful around every sharp turn along the coast. 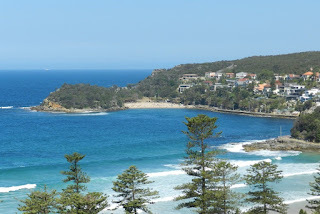 We skipped right through Angelsea, which looked like a great little beach town, and made our next stop in Lorne. After lunch, we hopped back in the car - next stop Apollo Bay! Well, that was the plan, anyway. Truth is we stopped another 4-5 times to snap a few more pictures along the coast before reaching our "home" for the next few days - the Rayville Boathouses in Apollo Bay. We arrived mid-afternoon, so we had plenty of time to take a look around town and check out the beach. The kids ventured about ankle deep in the ocean before deeming it too cold to go any further...Jennifer and I both agreed. I never expected this to be the case, but it makes sense that the water is so cold when you consider the only thing south of Apollo Bay is Antarctica! After warming up by the fire in our room, we got ready for dinner at Chris's Beacon Point restaurant. This was a recommendation from friends in Singapore, the Wihmann's, who view Apollo Bay their dream destination for retirement. The food was good and the view of Apollo Bay from the mountain was amazing. The next morning, we climbed back into the car, loaded with a few drinks, snacks and the warmest clothes we had packed. (Mom and Dad, you would have been appalled at how few things we packed in the car for a full day of driving and sightseeing. Probably a quarter of what you would have brought along....but then again, I could have eaten a few more crackers along the way had I only brought them.) After only about 35 minutes, we reached the first stop of our drive - the Cape Otway Lighthouse. Located at the very southern tip of the GOR, the Cape Otway Lighthouse was the second lighthouse ever built on mainland Australia, and today is the oldest remaining lighthouse in the country. While the clifftop lighthouse and surrounding area was beautiful, the drive in (about 3 mile drive from the GOR) was probably the highlight. 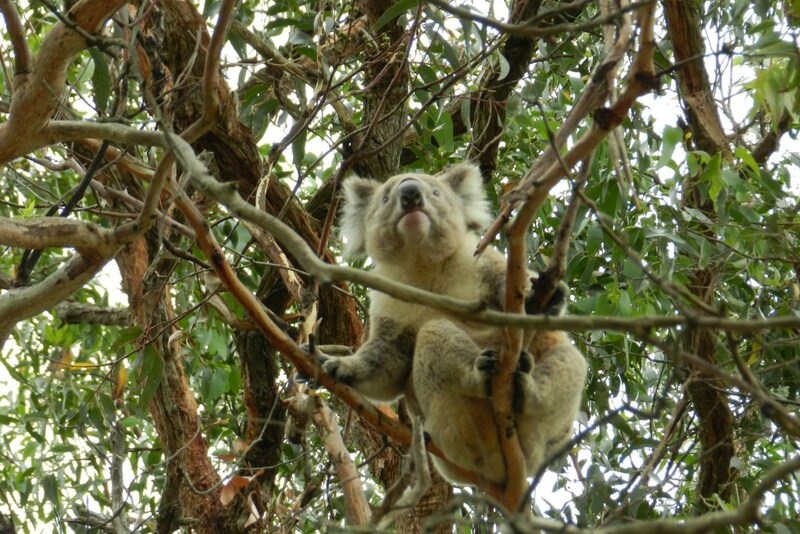 We had read that you were likely to see Koalas along the way, but never expected what we saw. 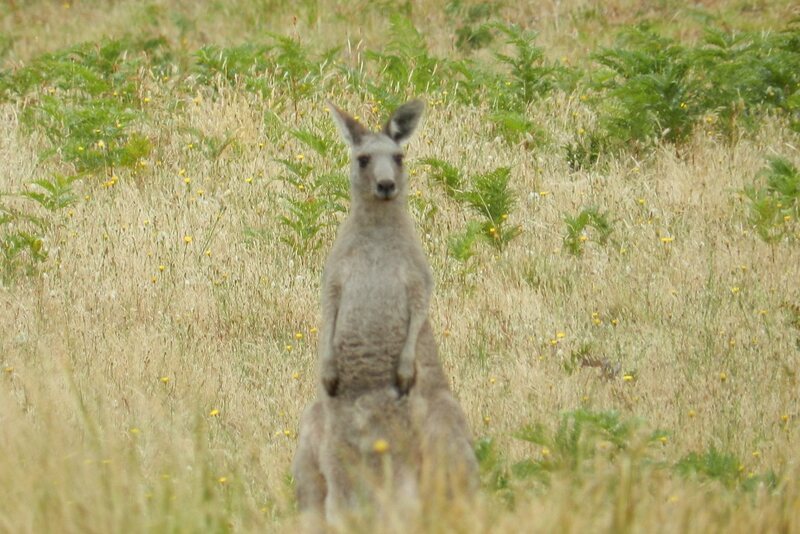 About one mile in, Jennifer spotted 8-10 Kangaroos bounding through a field. We stopped the car a little further along, hoping they'd hop right by us. Sure enough, they hopped through the field, eventually coming only 40-50 feet away before hopping off again. No more than a half mile further, several cars were stopped along the road, and passengers were walking around, necks craned, looking and snapping pictures of the Eucalyptus trees above. We stopped, expecting to see a few Koalas....but there were literally dozens - maybe a hundred in total perched in trees for the next 1/2 mile or so. It was really amazing to see so many, so close, and so active! After taking a ridiculous number of pictures (Jen: Ahhhh, that would be you. I just took a few, QUALITY ones. There is a reason your kids call you Ed, Junior. 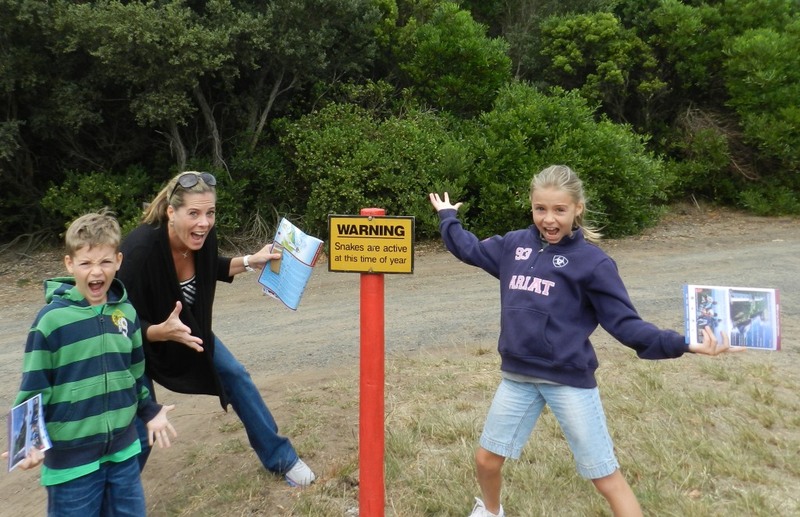 ), we continued on to the Cape Otway Lighthouse itself. We arrived at the right time, with only a few other visitors anywhere in sight. After parking and paying admission, we came across a sign you don't typically see in the states. "Warning! Snakes are active at this time of year". Active! What the hell does that mean? We cautiously made our way up the dirt trail to the lighthouse, half relieved/half disappointed not to come across a Black Adder along the way.....ok - mostly relieved. We climbed the lighthouse, checked out the WWII radar station, and got the kids a snack at the cafe (I highly recommend the milkshakes!) On our way out, we realized how glad we were to arrive when we did. The gift shop and registration desk were packed, as was the parking lot. As we drove back towards the GOR we stopped a couple more times, spotting a Wallaby (only 2 feet off the road) and dozens more Koalas - a few with babies. Back on the GOR, we continued toward Port Campbell and all the sights we wanted to see along the way. Gibson's Steps came first, offering a great view from the beach - one of only a few spots in the area where you can get to the beach itself (I think). Of all the spots we stopped along the GOR, this was the first where there was actually a "parking lot" vs. a slightly larger shoulder. About two minutes further up the road, we came to the Twelve Apostles - here, the parking lot, welcome center, cafe, etc. are all actually on the opposite side of the road (away from the ocean). It was also very obvious that safety was of utmost importance. Visitors still get a great view of the ocean and cliffs, but fences and barriers make it nearly impossible to fall or get hurt...which was nice considering the wind and number of people in the area. As beautiful and striking as the Twelve Aspostles are, a little further up the road we visited two more amazing spots...the aptly named "Arch" and "London Bridge". At both locations, the ocean has torn a hole in the sandstone, leaving an open arch through which the ocean flows. London Bridge was by far Cooper's favorite, after we showed him pictures and told him how one of the two original arches had collapsed in the 1990's. After seeing it ourselves, it brought to life how scary that whole ordeal must have been. people were stranded on the outer part and had to be rescued by helicopter! At this point, we were all pretty hungry, actually a little chilly, (Jen: A little? 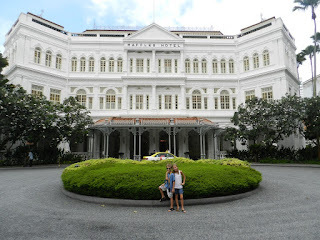 My Singapore climatized body thought we were in Fargo in January) and had seen some amazing views. We headed to Port Campbell for lunch and some shopping (Jen: I had to buy another sweatshirt, that's how cold I was). Port Campbell is a nice, quiet little town, with a bunch of restaurants and shops. We sat down at the Twelve Rocks Cafe and Beach Bar. (I recommend the steak sandwich - Scotch filet steak, egg, cheese, lettuce, tomato, bbq sauce, mayo w/chips). 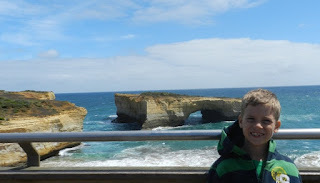 A highlight of this lunch stop in Port Campbell, however, came from Cooper. Walking through a narrow shop, we squeezed by other visitors, excusing ourselves along the way...behind us, as polite as could be, Cooper said "Excuse me, mate" in his best Australian accent. Good on ya, Cooper! Our last stop, before heading back to Apollo Bay for the night, was the Loch Ard Gorge. Here again, we were able to get to the beach and the view was amazing. There's only so much to say about each of these natural wonders. They are amazingly beautiful sights and I found myself asking "why is it some of the sandstone washed away, while in other areas it was left behind?" I'm sure Sophia would be able to educate me, but I probably wouldn't understand. In any event, hopefully the pictures give you a sense of the beauty. Once back in Apollo Bay (after a two-hour drive back from Port Campbell), we had dinner at Chill @ Apollo Bay, a tiny tapas restaurant about a block from the beach. Eventually, we made it to bed...which was very welcome after the long day. The next day, we headed to the small marina and checked out the beach at Apollo Bay. It was a nice way to wrap up our stay in this part of Australia and the kids really enjoyed searching the tidal pools for shells, crabs, etc. On the way out of town, headed back to Melbourne, we made one last stop at a small market set up on the grass lawn just off of the beach. Here, local artists, photographers, candle makers, etc. were selling all kinds of items. We found a great serving plate - a perfect souvenir from our visit on the Great Ocean Road. Less then 30 minutes later, the kids were asleep and Jennifer and I had a very quiet drive back to Melbourne (Jen: I finally was not terrified of his driving). Pulling into the driveway at the Vogers, the kids woke up, ready to play with their friends again. For Jennifer and I, we were just happy to be off the road - and ready for a beer on the back patio with our friends. About 20 minutes later, I had jumped three curbs, nearly ran down multiple pedestrians and clipped a bus with the passenger mirror (I'm still convinced this last one was Sophia's and Jennifer's imagination). We also got a little lost en route ....meaning, we crossed the Sydney Harbour Bridge (twice) and wound up in the Opera House parking lot without even realizing it. Eventually we made it to our rented apartment on Central Avenue in Manly, where I was more than happy to park the car for several days before getting back behind the wheel again. 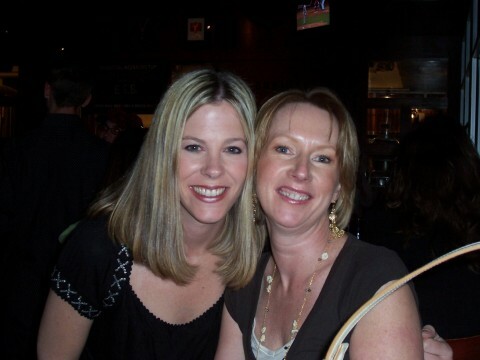 Jennifer's note: I must interject. He clipped a bus - really, he did. I heard and felt it but wasn't going to mention it to him because he was so freaked out about how horribly he was driving. Also, I couldn't waste my breath due to needing to scream, "MOVE OVER" at a moment's notice. Then, about 30 minutes later, Sophia decides to blurt out, "Dad, you know you hit a bus back there, right?" Ha ha ha ha. Busted! I just hope the new gray hair I had to pluck out doesn't grow back. Our home for the next few days was small, but offered plenty of room for the four of us, including a living room, kitchen, bedroom, bath and a small patio with amazing views of Manly Beach. There was also a roof-top patio with plunge pool. Aside from the lack of wi-fi, it was perfect (...and actually, it was kind of nice to be forced to "disconnect" for a few days). 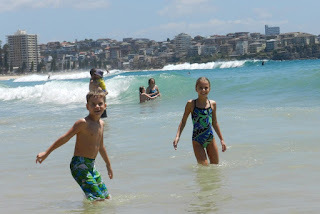 After taking an overnight flight from Singapore, we were happy to just enjoy the beach our first day in Australia. Thankfully, it was literally steps away from our rented apartment. Fortunately, our visit was for 16 days, so we didn't feel an instant need to sight see. 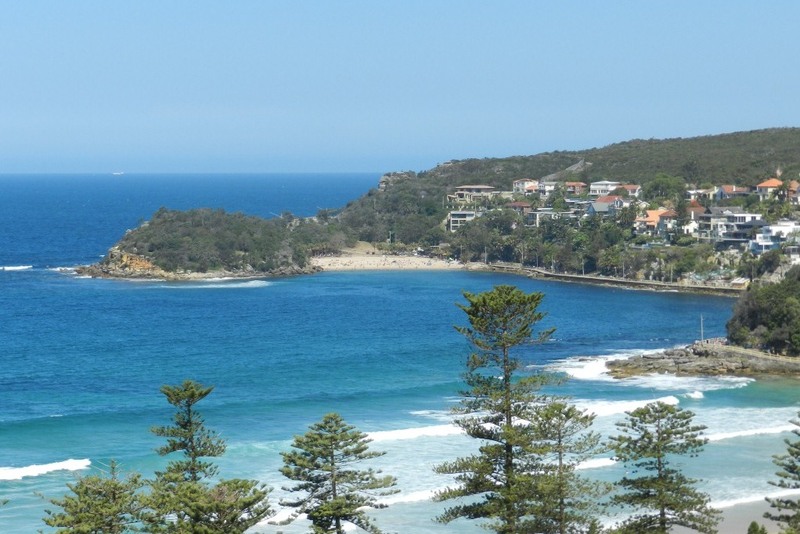 Eventually, we began to explore Manly and it was pretty much what I expected it to be. A very casual atmosphere, a ton of surf shops, bars and restaurants, and lots of blonde hair. At the beach, the kids enjoyed the *freezing* water while Jennifer and I enjoyed the warm sun and sand. There were a lot of people on the beach, but considering we were visiting during the "summer holiday", it was nothing compared to the crowds that I've become accustomed to on the east coast of the US. Cooper and I also took a short walk and found some local wildlife as well as several other beautiful beaches just around the corner. Over the course of the next few days, we really got to know Manly...at least as much as you can in a short visit. We found a favorite spot for breakfast (and free wi-fi), with good, spicy bloody marys, as well as a small local bakery for those mornings when we didn't have time to sit down and eat. 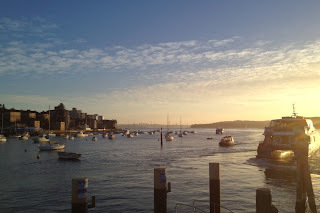 We tried multiple restaurants for lunch and dinner - some we really enjoyed (The Manly Grill), another we really didn't (Watervue)...and of course the kids were happy to find several ice cream shops for snacks before we headed back to the apartment and bedtime. 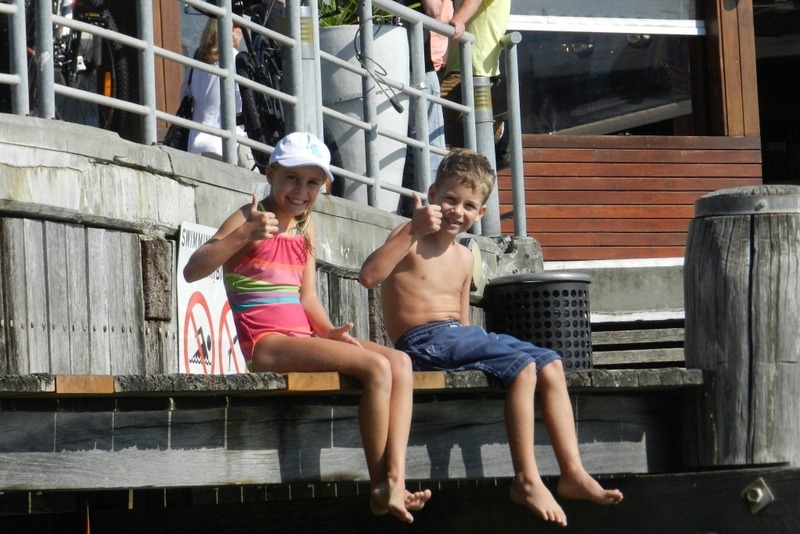 A favorite spot for us was the Manly wharf. There were two restaurants we really enjoyed at the wharf. One was a very casual place called the Manly Wharf Hotel (it's not a hotel). I think it's known as "the Wharfie" around town. It's situated directly on the wharf with great views of Manly Cove and seems to be a very popular spot for locals to grab a drink or bite to eat after getting off the inbound ferry from Sydney. Here is where Jennifer and I first became familiar with Australia's "do it yourself" way of ordering food and drinks - whereby you place your food and drink orders at the bar, collect a tiny table flag, then take your seat and wait for your order to be brought to you. No waiters or waitresses to tip (you don't tip in Australia regardless) and when you're done eating, no waiting for your bill. It was actually very convenient! Of course, we did leave Manly now and then. 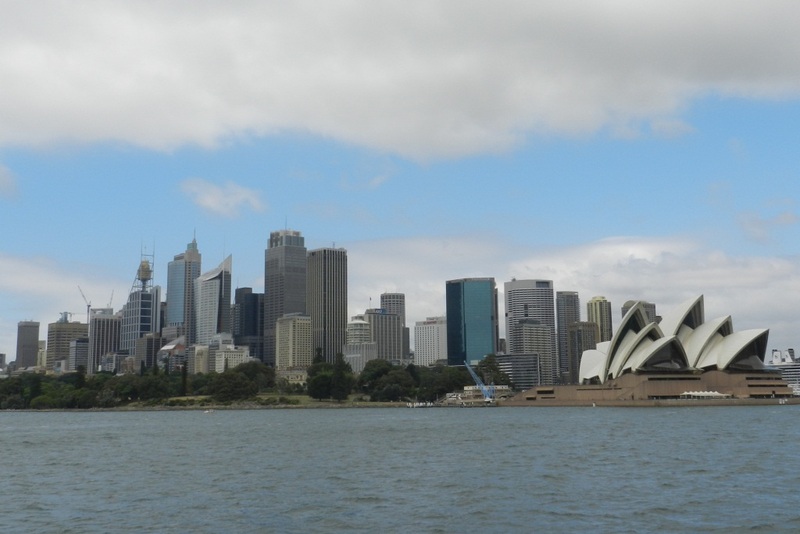 After all, we didn't fly all this way to sit on the beach, drink beer, and ogle bartenders - the city of Sydney awaited only a short ferry ride away. (Jennifer's note: speak for yourself.) We spent the better part of three full days in Sydney itself - though we could have spent much more time exploring everything in and around the city. 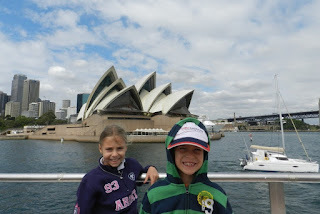 (I guess we'll have go back....I hope) The highlights, in my opinion, were the Coffee Cruise, the Taronga Zoo and simply walking around Circular Quay and other parts of Sydney Harbour. The Coffee Cruise (offered by Captain Cook Cruises) was recommended by one of our American friends in Singapore (thank you Vander Vennets!). They lived in Sydney for a while and had this among their list of "must dos". Not one to turn down advice of friends, we hopped on board the Coffee Cruise, which launched from Circular Quay. Departing at 10:00 am, the cruise offers coffee, tea, juices, etc. and a small selection of pastries - and takes passengers for a two hour tour around Sydney Harbour. 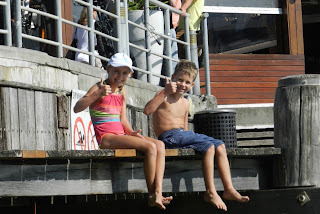 It's a great way to see most of the key attractions in the harbour and hear some history, but the main attraction is the pithy commentary from the tour guide who both educates and entertains throughout the journey. No surprise to most of you, the Taronga Zoo was a must see for us. Our animal lover, Sophia, would have it no other way. Luckily, we all typically enjoy a day at the zoo and our day at the Taronga Zoo in Sydney was no exception. To start the day, Jennifer and the kids reluctantly joined me in the car for another white knuckle drive through Sydney. Admit it Jennifer, I was significantly better this time around. (J: marginally) We were met at the zoo by a co-worker of mine, who graciously gave us the complimentary SAP Corporate zoo pass...saving us more than $130. (the Taronga Zoo is expensive! Twice as expensive as the Singapore Zoo). The zoo housed the usual characters: giraffes, lions, elephants, monkeys etc. 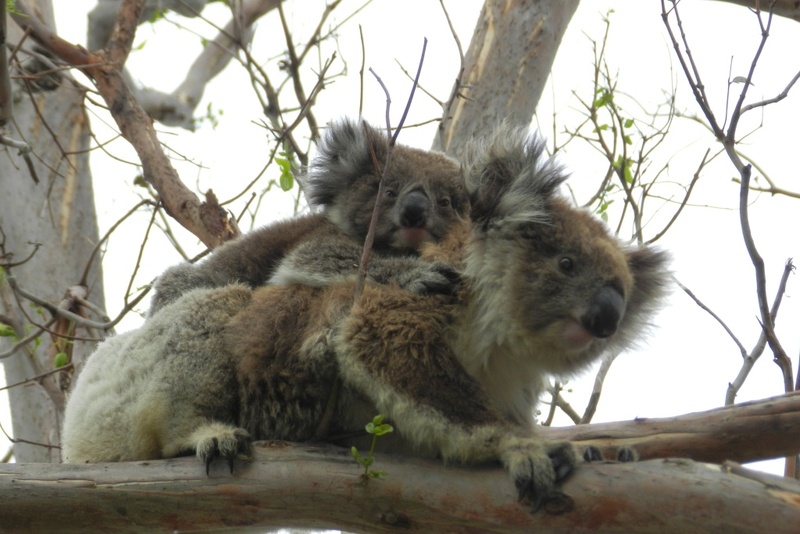 as well as special "local" exhibits full of snakes, kangaroos, wallabies and koalas. What made it a truly unique experience was the view of the Sydney Harbour, Opera House, Harbour Bridge and city in the background. It's not every day you see mountain goats climbing on rock formations with that view in the background. Cooper was so amused that a sea lion was named Cooper! While the views of Sydney from the cruise and zoo were amazing, I have to say my favorite parts of our visit in Sydney were our walks around the Harbour and surrounding streets. We had beautiful weather - not always bright sunshine, but that was actually nice because it offered cooler temperatures than what I've experienced in the past 10 months. It made long walks more comfortable and allowed us to enjoy the city without sweating to death (i.e. every day in Singapore). 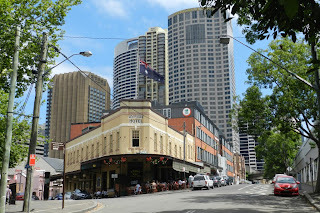 Circular Quay (a quick ferry ride away from Manly) was always our starting point, from which we ventured out and about. We visited the Opera House and took the obligatory photos of the kids on the steps (of course). SPOILER ALERT - the Opera House is actually not a flat white as it appears in photographs. It's actually more of a grey color with a waffle-like pattern on the "sails". After visiting the opera house and having lunch in its shadow, we headed towards the Botanic Gardens...but never made it. Instead, a friendly Aussie gentlemen stopped us and encouraged us to walk the mile or so from Circular Quay to the Harbour Bridge where we could walk to the middle and get a great view of the city. Again, not one to turn down friendly advice, we made the walk - and it was well worth it. In addition to the view from the bridge, it took us directly through an area called "the Rocks"- so named because the original buildings (constructed shortly after colonization in the 1780's) were made largely of local sandstone. The area was historically a slum, often frequented by sailors and prostitutes, but these days it's a quaint tourist area full of shops, restaurants, bars and expensive real estate with prohibitive conservation restrictions. Here we found a great little restaurant at the Australian Heritage Hotel where we could sit outside with a fantastic view of the Harbour Bridge. After five days in Manly and Sydney, it was time to head to Melbourne to celebrate the holidays with our friends, the Vogers. We were all very anxious to see our old neighbors, but were also a little sad to leave Manly and Sydney behind. In fact, Jennifer and the kids all shed tears as we left the apartment in Manly and packed our things in the car...but in hindsight, maybe they were just afraid to get back in the car with me for another (J: terrifying) ride through Sydney and to the airport. No problem. By the time we got on the road toward the Sydney airport, I had figured out the whole right side driving thing...just in time to take on the winding, clifftop drive down the Great Ocean Road that awaited us in Melbourne!